Allah Dino Khaskheli Sindhi Classical Music Singer. He was born on 25 January 1966 at Mirpur Bathoro Sindh. He has sung lot great Sindhi Cultural Songs. He is great Sindhi Folk Music Singer, he created great name in Sindh Music. He got Music training from his father. 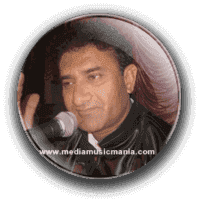 He has many albums of Sindhi songs to his credit. He sung poetry of Shah Abdul Latif Bhitai R.A, Sachal Sarmast R.A and others. He played a great role in popular Sindhi Cultural Music, Sindhi Songs all across the Sindh. He enriched the world of music and enthralled the audiences with his masterful artistry. His soulful rendition has been bringing solace lot of hearts. He is one of those rare Classical Musicians who expanded the peripheries of Classical Songs by taking it to the common masses.His rendering of "Sindhi Kalam" "Sindhi Kaafi" was divine and used to enthrall and transfix listeners, and transport them into a different world, he sung his classical Lok Music on Radio Pakistan and local TV Channels, Marriage ceremonies, Mela and Shrines of Bizrigs in Sindh and other local Mehfils. Sindhi love and affection songs Sindhi Traditional Songs are still very popular such as Moriro, epic story of Dodo Chanesar, to the chivalrous character of Marui which recognizes it among the contemporary old stories of the locale. The romantic tale of Sassui, who pines for her sweetheart Punhu, is known and sung in each Sindhi settlement. Allah Dino Khaskheli has sung the folktales of Sindh in songs with Village to Village and City to City in Province of Sindh. I have selected most popular Music of Allah Dino Khaskheli.